Kyle Busch won one for hometown fans on Friday night and has his sites set on collecting two more NASCAR victories at Las Vegas Motor Speedway this weekend. Friday’s win came in the Camping World Truck Series event. Next up for the Las Vegas native is Saturday’s Xfinity Series race and then on Sunday, the main event; the Monster Energy Cup Series race. 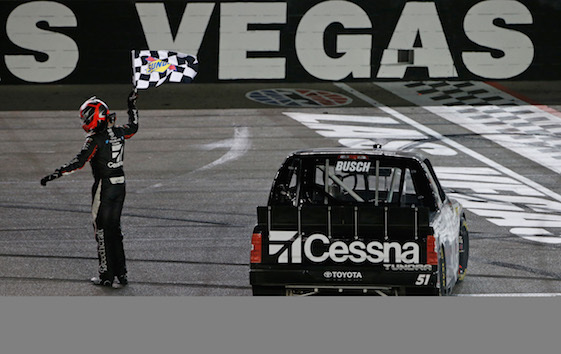 Busch beat Johnny Sauter to the finish line by .437 seconds on Friday. The victory was his first at Vegas in a truck. “It means a lot,” Busch said. “We’ve had some great runs in the races that we’ve had at Kyle Busch Motorsports. We’ve raced and won all across the country, but I’ve just never been able to get back to Las Vegas to run a race. Poor restarts cost Sauter a chance to battle for the victory after the final restart on Lap 124 of 134. (1) Kyle Busch(i), Toyota, 134. (3) Johnny Sauter, Chevrolet, 134. (6) Brett Moffitt, Toyota, 134. (8) Grant Enfinger, Ford, 134. (2) Stewart Friesen, Chevrolet, 134. (18) Dalton Sargeant #, Chevrolet, 134. (15) Ben Rhodes, Ford, 134. (14) Cody Coughlin, Chevrolet, 134. (17) Justin Fontaine, Chevrolet, 134. (13) Austin Hill, Chevrolet, 134. (7) Justin Marks(i), Toyota, 134. (5) Noah Gragson, Toyota, 134. (4) Spencer Davis, Toyota, 134. (20) Wendell Chavous, Chevrolet, 134. (10) Myatt Snider #, Ford, 133. (19) Austin Self, Chevrolet, 133. (16) Jordan Anderson, Chevrolet, 133. (24) Robby Lyons, Chevrolet, 133. (22) Michel Disdier, Chevrolet, 132. (23) Bayley Currey, Chevrolet, 132. (9) John H. Nemechek(i), Chevrolet, 130. (26) Mike Harmon(i), Chevrolet, 127. (31) BJ McLeod(i), Chevrolet, 123. (27) Jennifer Jo Cobb, Chevrolet, 123. (25) Josh Reaume, Toyota, Engine, 119. (30) Norm Benning, Chevrolet, Parked, 118. (28) Tommy Regan, Chevrolet, 112. (11) Justin Haley, Chevrolet, Accident, 75. (12) Matt Crafton, Ford, Brakes, 40. (32) Mike Senica, Chevrolet, Electrical, 28. (21) Joe Nemechek, Chevrolet, Vibration, 23. (29) Scott Stenzel, Chevrolet, Electrical, 5. Average Speed of Race Winner: 122.665 mph. Time of Race: 1 Hrs, 38 Mins, 19 Secs. Margin of Victory: 0.437 Seconds. Caution Flags: 5 for 25 laps. Lead Changes: 14 among 7 drivers. Lap Leaders: K. Busch(i) 1-15; S. Friesen 16-20; N. Gragson 21-32; G. Enfinger 33-35; K. Busch(i) 36-39; G. Enfinger 40; K. Busch(i) 41-42; S. Friesen 43-68; B. Moffitt 69-70; K. Busch(i) 71-83; B. Moffitt 84-108; K. Busch(i) 109-114; D. Sargeant # 115-117; J. Fontaine 118-119; K. Busch(i) 120-134. Leaders Summary (Driver, Times Lead, Laps Led): K. Busch(i) 6 times for 55 laps; S. Friesen 2 times for 31 laps; B. Moffitt 2 times for 27 laps; N. Gragson 1 time for 12 laps; G. Enfinger 2 times for 4 laps; D. Sargeant # 1 time for 3 laps; J. Fontaine 1 time for 2 laps.